Eating 41 year old spag bol with a big fat wine! I had one of those “do I or don’t I?” moments with this one. It’s the whole “Is it really blog-worthy?” or maybe more so “Can I even be bothered?” I do know that some people really enjoy blogging all the time about everything that comes to mind, and that works well for them. We here at The Wine Wankers prefer to write about our more interesting wine experiences that at least tell a bit of a story rather than it being a detailed description and rating of each individual wine we consume. This particular wine experience was a borderline one and very touch-and-go but in the end I saw just enough blog-worthy signs to get it over the publishing line. 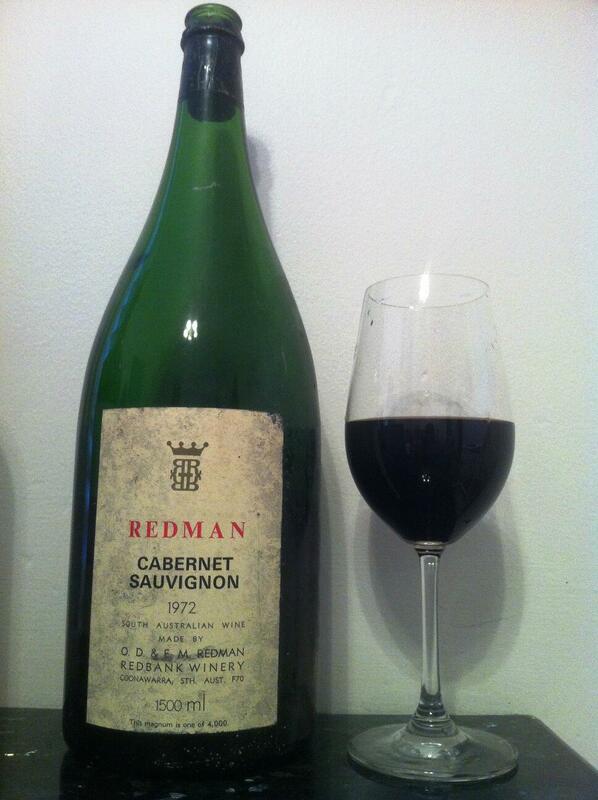 A couple of months ago I picked up a magnum of 1972 Redman Cabernet Sauvignon from auction. I blogged recently about not having much luck with the 1972 Redman Claret I had also picked up. These old Redman wines, from Coonawarra in South Australia, seem to come up at auction quite a bit so a few people must believe them to be rather age worthy. I was hoping this magnum of Cabernet would show me why rather than solidifying a belief of “what the?”. Over the weekend I decided to pop open the magnum… my curiosity had gotten the better of me. And it wasn’t only that, I was cooking up a bolognese sauce and wanted to try adding an aged and character filled wine to see if it made a difference. This bottle was the perfect choice because it meant that there would still be a lot left to drink after using it in the mix. Popping the cork was a delicate and tender exercise. All slow and steady so that I didn’t tear it apart. No man-handling this baby! But as soon as the cork was loose I was hit with fumes in a similar fashion to the failed 72 Redman Claret. My heart sunk. Where to tip this? The sink? My wife was leaning that way. Instead I poured it into the decanter and waited a while. A risky move with aged wines because some will just drop away into a flavourless and/or harsh liquid if left in the air for too long as they’ve already done their time with oxygen. There was nothing to lose with this one though. May as well give it a shot! The change after being decanted for quite some time was astonishing! It had dropped off the eye watering fumes and there was some good hints of fruit in there and even a bit of chocolate in the air. So a few tips into the sauce and a few more into our glasses just for fun. Surprisingly it turned out quite ok after all. It was very smooth to drink, having dropped a lot of sediment over the years. And there was a bit of enjoyable blackcurrant-like fruit in there and some interesting aged smoky and earthy characters, like leather even. And some sense of chocolate along with a hint of olive popping up from time to time. The bottle lasted us a couple of nights and was even better each time, softening up further but retaining flavour. Now it was never great and it was past its peak but it was still an interesting aged wine. Luckily I didn’t pour this one, I was oh so close. Oh, and thanks to @zeldasydney from The Illustrated Wine who commented on my tweet of the Redman bottle over the weekend saying “Love your auction finds!” and to Daniel Redman himself who discovered the tweet and retweeted it. A fellow wine blogger Talk-A-Vino mentioned the conundrum on deciding what to and what not to blog about, and basically concluded that you blog about whatever you want to, it’s just finding the time that can be difficult (so true). All these signs were the final encouragement I needed to write this post. Well, you certainly sucked me in with your title! Well done. I thought you must have found an old can of spaghetti in the back of the cupboard! Now I think that would be more of a risk than the wine. I’m pleased it all turned out so nicely for you. The meals look delicious! I wonder how many other wines that followed their fate down the drain may have improved by sitting as this one did. I thought “41 year old spag bol” sounded better than “spag bol with 41 year old ingredients” 😉 I had a feeling this one just needed to release some pong and settle. The few I have poured have been way past borderline. I will usually at least try. Thank you so much for your frequent visits and numerous tweets of our blog Norah! You’re welcome. Always enjoyable. And I return the thanks to you. I like your storytelling approach! What actually mesmerized me was the photo of the spaghetti and gnocchi! Mmmmm. Thanks Linnet! I wanted spag bol and my wife wanted gnocchi. She has a habit of getting what she wants so I had to cook two lots of pasta. Made a good photo! What a gentleman, cooking the his-and-hers pasta. I must try that with the Long-Suffering Husband! Sounds like a fun experience. Great that it worked out so well. Some Aussie wines have some really good aging potential, but 41 years is pushing it. These Coonawarra Cabs are known for the age worthiness. And with your visits to our blog I think you’re a little more open minded than your typical “snobby French wine-mind”. 😉 Thank you! Oh I love wine from everywhere, I just don’t know a whole lot about “New World” wines ! Your dishes looked scrumptious and now I really need to know about the 72’s. Congrats on the retweets! loving your success–congratulations! I think blog topic is less important than how it’s written up. If you’re passionate about what you’re writing about (which you and your fellow Wine Wankers clearly are), then it’s going to be a good read. Thanks so much Liz, good words indeed! There’s some good ones out there. Enjoy! Maybe it’s a Yank thing but I had to read to see what a “spag bol” was- thought it sounded Asian or Eastern European-hahaha. Glad you had a great experience with the 72- I must say it was a great year for producing a lot of things- did I just give away my age? I have nominated you for Blog of the Year 2013 Award. I really get it if you don’t accept awards or you’ve been given like a trillion already because your blog is so great, no worries. And take your time, just know that your blog is wonderful and appreciated. And Congratulations! on being chosen for the ‘Blog of the Year 2013’ Award. Thank you so much for considering us down here. Cheers! Conrad, I like how you salvaged this poor wine from the drain! It just goes to show that all OLD things aren’t bad or worthless. And I’m kind of wondering, if the aged bottle was fairly decent, what would a fresh bottle have done for your meal? Does that mean the other one could have been saved? Maybe you drank it too early last time. This one was very borderline but turned out ok. The other one was a cloudy colour and far too gone sadly. The other wine had a real intense vinegar smell too. I’m glad that I figured out what “spag bol” is . . .
A charming essay and a wonderful learning experience. Never presume, until you have all of the facts. There is always so much to learn about this wonderful hobby of ours. There sure is! Thanks for your regular visits. Cheers! Conrad, thanks for the nod! Glad to be the source if inspirations : ) This is what works well in the world of blogging – we all take inspiration from one another. I find that this external inspiration definitely helps when I have to decide “to blog or not to blog”. That ’72 wine sounds like a great experience! Cheers! I’ve been learning a lot since we started this blog and began interacting. Yes, the 72 wine was a great experience indeed! Never been to a wine auction. I’d be afraid that everything I bought would be garbage. I just watched a documentary about COSTCO ( wholesaler here in the US ) . It shows professional wine tasters sampling wines of different wine producers . Wine producers are really eager and praying their brands get chosen to be sold at all Costco stores. Since my family’s not wine savvy, we depend on Costco products and trust their wine selections. What do you think ? Personally I feel that the small local dedicated wine shop will have the best selection of top drops because they are usually very passionate about their wines. I have no doubt though that the likes of Costco would have a good combination of quality to price wine meaning that they’d get in some decent wine at a very competitive price, with price always being the most important thing to them, in my own personal point of view that is. Love how you cook, choosing a bottle of wine large enough to use with the dish and still have plenty to drink after. I’m glad the wine didn’t disappoint because the 2 dishes look fantastic. I would have never thought that leather flavor in a wine would be enjoyable. However I do like the taste of some leather. I used to chew on the strings on my first base glove, haha. As that a leather teeth clencher? I guess it’s better than biting a lead bullet. I had the laces chewed to bits, haha. Had to replace them.